I’m in love! He has blue eyes, reddish-blond hair, and a hesitant smile. A dimpled chin hints of mischief. Long, tapered fingers suggest a gentle soul. And he loves to cuddle. 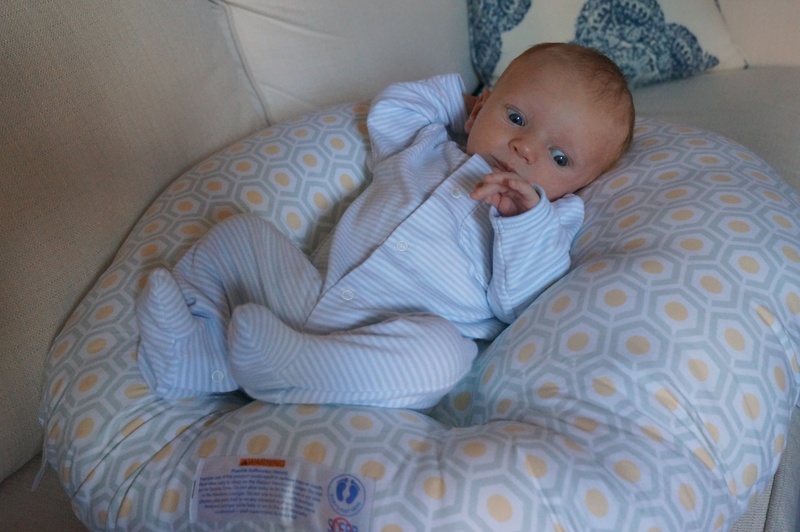 He’s my beautiful five-week-old grandson. Friends told me how wonderful the experience of a first grandchild would be. And they were right. Instant love, instant bonding. He cries and I jump. He settles and we all relax. After our daughter feeds him, every inch of his body releases into slumber – what we’ve come to call a ‘food-induced coma’. Every look, every wobbly lift of his head, every wave of hand or leg prompts feelings of joy and poignant memories of the past. A new generation represents the future. Not a collective future but the future of our little family, the one my husband and I started, the one that implies continuity from our parents and grandparents, all except my mother gone from this life. We’ve had two visits since he was born and we’ve watched our daughter and son-in-law as tentative attempts to soothe, diaper, and feed gave way to more confident approaches. We heard them refer to one another as Mommy and Daddy. We saw their looks of joy and amazement, the kind that say ‘this is our child’, ‘we produced this tiny miracle’. When we said our goodbyes Sunday night, I kept my emotions under control despite knowing that I wouldn’t see them until the end of August. It was only when our daughter began to cry that my eyes filled but I blinked the tears away for I’m the grandmother, the mother of the mother, and she needed my strength and encouragement not my tears. Oh congratulations! There is nothing as precious as the birth of a grandchild! It puts one in mind of the connection to the past and, at the same time, the promise of tomorrow. Enjoy every precious moment! Thanks Linda … you’ve expressed it so well. Wow! Such powerful emotions! I know the first grandchild holds a special place in a grandparent’s heart. It becomes an unbreakable bond. Congratulations! Thanks Rachel. I like the idea of an unbreakable bond. I’m sure I could have been more eloquent but as it was I had tears in my eyes writing what I did!! Congratulations Mary – no one can really understand how it feels until they personally experience being a grandparent! Thanks Tony … I take it that you have had that experience too! Congratulations Mary! He is adorable. You are truly blessed, he’s beautiful. Congratulations. How wonderful! May you enjoy many, many happy years ahead!